Gheibihayat, S., Sadeghinia, A., Nazarian, S., Adeli, Z. (2015). Mechanisms and Performances of Adjuvants in Vaccine Immunogenicity. Journal of Applied Biotechnology Reports, 2(3), 257-264. Seyed Mohammad Gheibihayat; Azam Sadeghinia; Shahram Nazarian; Zahra Adeli. "Mechanisms and Performances of Adjuvants in Vaccine Immunogenicity". 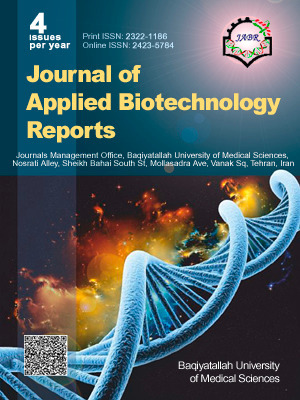 Journal of Applied Biotechnology Reports, 2, 3, 2015, 257-264. Gheibihayat, S., Sadeghinia, A., Nazarian, S., Adeli, Z. (2015). 'Mechanisms and Performances of Adjuvants in Vaccine Immunogenicity', Journal of Applied Biotechnology Reports, 2(3), pp. 257-264. Gheibihayat, S., Sadeghinia, A., Nazarian, S., Adeli, Z. Mechanisms and Performances of Adjuvants in Vaccine Immunogenicity. Journal of Applied Biotechnology Reports, 2015; 2(3): 257-264. An adjuvant is a substance that is added to a vaccine to increase the body's immune response to the vaccine. Vaccines containing adjuvants are tested for safety in clinical trials before they are licensed for use. The basic action of adjuvants is stimulating adaptive immune responses. Adjuvants recently licensed for human utilization involve alum squalane oil or water emulsion, influenza virosomes, and few cytokines as IFN-γ and IL-2. Some adjuvants are currently under investigation such as DNA motifs, monophosphoryl lipid A, Cholera Toxin, E. coli heat Labile Toxin, Saponins, Immunostimulating complexes, liposomes, Flt3 ligand as a pleotropic glycoprotein, non-ionic block copolymers. This paper is an overview of most commonly used adjuvants, adjuvant mechanisms, adjuvant formulations and adjuvant limitations.